Working lunch? Let the food do the talking! Looking for sandwich delivery in Norwich and beyond? Look no further! Regardless of how interesting the meeting/session is, chances are what participants and attendees will most likely remember is whether or not the lunch is good! So if you’re planning New Year training sessions or lunchtime meetings then it’s worth making an effort to find the right sandwich delivery service. So, what are the key considerations when choosing a sandwich delivery service? Reliability – if you plan to eat at noon, it’s vital the food arrives in good time – and it’s what you ordered! Flexibility – to cope with food allergies and intolerances, as well as fussy eaters! And what about ordering? Can your sandwich delivery partner deliver at relatively short notice or do you need to order a week in advance? Variety – a range of quality breads and fillings to satisfy everyone. Professionalism – remember your suppliers reflect your brand values and standards! Value – a quality lunch at a reasonable price. Optional extras – is it a fixed package or can you pick and mix? With city centre premises and a full-time team of top chefs and experienced sandwich makers, Expresso knows its stuff when it comes to sandwich delivery! Artisan breads, innovative fillings, home-made cakes and savouries… Expresso sandwich lunches are a refreshing change from the norm. Operating seven days a week across Norwich and beyond we’re proud to deliver sandwich lunches (and suppers) to some of the county’s top businesses, as well as leading charities, housing associations, centres of excellence, training providers and broadcasters. With minimum numbers as low as six – and free city centre delivery – it’s no wonder Expresso is a leading sandwich delivery provider! From breakfast bacon rolls through to hearty lunches, afternoon tea and supper – workplace catering need never be the same again! So why not ring the changes in 2017? 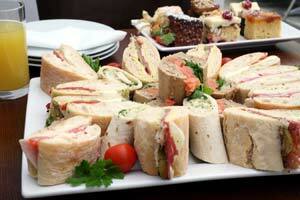 Call us to discuss your needs or to arrange for a sample sandwich lunch delivery.